Jeremy Lin rises up for the game-winning 3-pointer Tuesday against the Raptors with 0.5 seconds remaining. He scored 27 points with a career-high 11 assists as the Knicks won their sixth straight game and fifth straight with Lin in the starting lineup.Jeremy Lin recorded a three-point play to tie the game with 1:05 remaining, then hit a 3-pointer with 0.5 seconds left to give the New York Knicks their sixth straight win, 90-87 over the Toronto Raptors. Lin finished with 27 points and a career-high 11 assists, giving him 137 points in his first five career starts. According to the Elias Sports Bureau, that’s the most for any player who began his career since the NBA-ABA merger in 1976-77, passing Shaquille O’Neal (129). Lin had his best game of the season shooting from long distance. 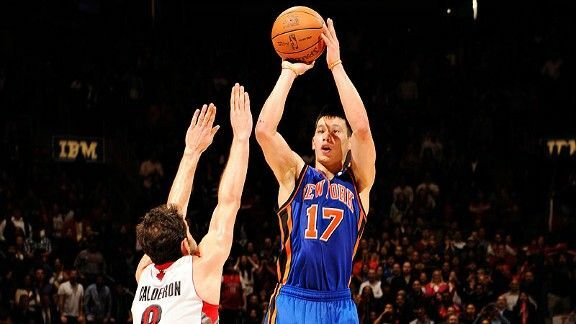 During the first five games of the Knicks’ win streak, Lin made just 4-of-18 from 20 feet or farther; against the Raptors he hit all four attempts from that distance, including the game-winner from 25 feet away. Lin struggled on mid-range jump shots Tuesday -- he didn't hit one field goal from 10-19 feet -- after shooting 62 percent from those distances in the first five games of the Knicks winning streak. He also creates for his teammates, something the rest of the team failed to do Tuesday, despite the return of Amare Stoudemire. The All-Star forward was 5-for-10 off Lin passes and just 3-for-12 in all other situations. Stoudemire’s results were typical of the night the Knicks had -- when Lin was involved the rest of the team shot better. It’s Lin’s sixth straight 20-point, 7-assist game, tying Walt Frazier and Micheal Ray Richardson for the longest such streaks in franchise history (according to Elias). It’s also the longest such streak in the NBA this season -- LeBron James is the only other player with a streak longer than three games. Lin scored 12 of his 27 points in the fourth quarter as the Knicks took control of the game in the final 4:15, outscoring the Raptors 13-1 and outrebounding them 8-2. During the winning streak, he’s increased his scoring output in every quarter. This season he’s scored 82 points in the fourth quarter and just 111 in the first three quarters combined. It wasn’t all roses for the young guard. He committed eight turnovers Tuesday, the second time since last Monday he’s done that. Lin’s the only player in the NBA with two eight-turnover games this season. He’s got 30 turnovers in the past five games, the most for any player in his first five career starts since turnovers became an official statistic in 1977-78.